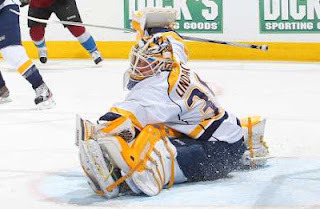 Some of the first bits of trade information heading into draft week have arrived in the aftermath of Friday’s deal that saw Tampa Bay acquire promising (and huge) goaltender Anders Lindback from the Nashville Predators. While the package put together is somewhat newsworthy, it’s the other ‘tenders targeted and teams left in the hunt that appear just as interesting. So who else was Steve Yzerman looking at when assessing candidates to be the Lightning’s future backstop? Sources tell Sabres Prospects that, aside from being rebuffed when inquiring about LA’s Jonathan Bernier, Tampa Bay was also hot on the trail of former Vezina and Conn Smythe winner Tim Thomas before pulling the trigger with the Preds. Thomas’ uncertainty over next season raised some obvious questions, but it looks like at least one team is perceiving his “personal leave” as posturing for different colors. Tampa Bay making their investment leaves two clubs, Toronto and Columbus, desperate for a number one goalie who can play now. With the market bare for both starters and backups, I’m being told that the only teams offering high caliber stoppers are Vancouver (Roberto Luongo) and St. Louis (Jaroslav Halak and Brian Elliott). Coincidentally, the Leafs and Jackets hold two of the first five picks on Friday. In fact, the goalie market is so dry that exiled vet Cristobal Huet is talking to a handful of NHL clubs about a reserve role. Huet, who turns 37 this fall, has been buried professionally in Switzerland the past two seasons while his contract with the Blackhawks expired. Not Sweden. Not Finland. Not the KHL. Switzerland – a place usually seen as a one-way destination for former NHLers.. In my opinion, the thin market makes Bernier a hot commodity as a backup, and potentially even as a starter in a place like Columbus, where a big name like Luongo (or even Thomas) may not be agreeable to going since, well, his stats are almost guaranteed to take a hit. For those curious, New Jersey has apparently informed clubs that they are looking to extend Johan Hedberg one more year, effectively removing him from the radar of goalie-needy clubs. Again, thin market. The Sabres aren’t directly involved in any of this madness but it’s something to keep an eye on as the weekend plays out. It’s always fun to see the Leafs scramble. It's nice to see the Leafs' suffer, but it is to be expected under the current regime. Burke's 'I'm the smartest guy in the room' schtick has probably resulted in his subordinates acting like a bunch of brainless yes-men, blindly pursuing his fractured template of what makes a competitive hockey team even if that template has flaws. To be honest, I hope Toronto signs Burke for another 20 years. This way, they should advance into the second round of the playoffs by 2028, maybe even 2026 if they get a few good bounces. And its weird how the perception of that commodity of 'goalkeeper' changes. A few years ago it was thought that you can win with average goaltending. Now it appears that you need that top 10 percent keeper in order to keep selling playoff tickets. I realize the salary cap can do odd things in terms of how roster construction is done and perceived, but really, you can't skimp on a good goalie. Geeze, what helped Burke's Anaheim win the cup was that the current rules allowed Giguere to essentially saw an Ikea King size mattress in half in order to make goalie pads, wear an oversize jersey that could house two sumo wrestlers and a glove so big that it could be used to trawl salmon in the North Pacific. But yes, long may the Leafs squirm. Hey Marty Biron, sign with CBJ if you want to be a starting goalie again. Burke can be an intimidating figure where you are just waiting for something huge. But at the same time, over the past few years, you hear about the Leafs being in the mix for big names all the time, and that includes the draft - like when he was mad about not getting Brayden Schenn. I think GM's have his number and aren't going to give in to his over-agressive nature. When their young guys still need work, the assets do not seem as attractive. Years of poor goaltending since his arrival hurt him, and now that he has a guy on the rise in Reimer (spellings?) i am sure there are rumors of him being moved now too. I hope Galchenyuk and Dumba are both off the board when they pick, you can maybe argue Forsberg instead of Dumba but I want them to be denied that elite center and tough d-man that everyone says the fans will love. Grigs has too many question marks so I will settle for the Leafs landing that guy. I hate how Leafs fans think it is their God-given right to land every big name free agent or a guy that is rumored of being shopped. It was a beautiful thing when guys like Mike Richards, Brayden Schenn, Jeff Carter, Brad Richards, etc were all falling out of the picture. Like music to my ears. Kris, I am very late on this with the draft being tomorrow but i think i might have to fianlly get a twitter accnt so i can follow you. Literally, you soley are inspiring me to get a twitter. I dont like missing your chats like with Vogl or Whitey. How long have you been this interactive because i have followed the site since the Myers draft and do not ever recall this much publicity? 8:01 - it has been a busy year unlike any previous. Team results didn't leave many much choice, but having a bunch of folks like you who have been visiting for a while create enough energy to make folks like WGR and TBN interested in adding a different layer to their coverage. So thanks a bunch to all for reading! Bobrovsky traded to Columbus for three draft picks, so that only leaves the Laffs as last team standing trying to address their goaltending woes, which is nice.